Home > Affording a Mortgage > Should I Go for a Discounted Mortgage Deal? With increasing uncertainty looming over the Bank’s base rate, mortgage lenders have decided to take a gamble and an increasing number of them are offering discounted mortgage rates. But discount mortgages are not for everyone and these questions should help you decide whether a discounted rate is the best one for you and where you should go to find one. 1)	Are You Willing to Take a Gamble on Your Mortgage Rate? 2)	What Are Your Circumstances? 3)	What Will Be Your Situation in a Few Years? 4)	Is it Just You on the Mortgage? 5)	What Type of Property Are You Buying? It sounds like you should go and visit a financial adviser who offers advice free of charge. You do not sound like you are suitable for a discounted deal and you could end up in serious financial trouble if you do go down that route. There is the possibility that if you don’t understand the inner workings of a discounted deal you could end up walking a bank or buildings society and being given one without you realising. If you just like the idea of a discounted rate because of its introductory rate then you could e on dangerous ground, especially if you do not expect to have more money to pay the higher rate when the discount comes to an end. For a more in-depth review of your finances you should visit a financial adviser. If you can afford to take a risk you should not rule a discounted mortgage out. Banks will offer two types of discounted mortgage. A discounted mortgage will usually have a set fixed rate for two or three years and then move to a higher rate after that period. If you do decide to switch to another deal before the increase you will often face large penalties. Another type of discounted rate is a discounted tracker, which will track the Bank’s base rate at the end of your discounted period, which is why it is risky, as the interest rate can rise a lot in a couple of years. It might be worth going to visit your bank and a financial adviser to see what they both offer you. An adviser will be able to talk you through the ins and outs of the deal and arm you with some information before you decide on which deal. If you like a gamble than a discounted mortgage could be your type of mortgage. 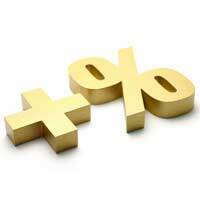 If you have the financial security should your rate increase tenfold then a discounted rate is not so much of a risk. If the property you are buying is not a risky investment and you expect to be earning more in a couple of years, this should cover any shortfall that might arise from an increase in interest rates. If you truly feel you understand what a discounted deal is you might be able to bypass an adviser and head straight to the bank. All good things must come to an end and a discounted mortgage is no different. It is important that you know how a discounted mortgage works and what it means for your monthly payments in a few years’ time. It might look attractive now, but once the rate rockets up, a discounted mortgage could lose its appeal, which is why it’s important to seek professional advice.